Nothing is a sure bet in life – except that anything that could go wrong, will go wrong. This is particularly true if you’re busy and especially cannot afford anything to go wrong. This cheery little message isn’t intended to contribute to the concerted worldwide political campaign to keep you awake at night. There’s plenty of that! Stay with me. When marketing our businesses, we need to stay on message if we’re to have any hope of cutting through the noise, clutter and distractions. We must repeat ourselves if we’re to be seen, heard and recognised. We need to repeatedly tell our stories if we’re to connect and inspire change in others. 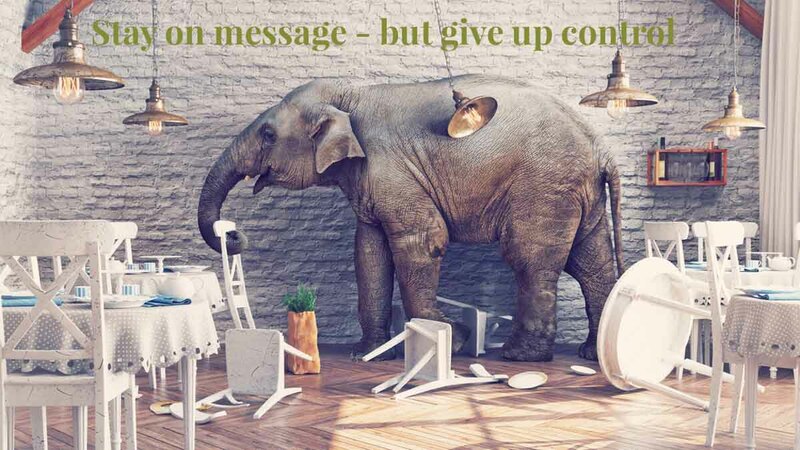 How do we ensure that our marketing messages aren’t seen as ‘clutter’ or ‘distractions’ by your community? How do you make stuff – whether a podcast, video, blog post or free, multi-part educational series – that people actually anticipate, value and use? Relevancy. People gather in clans. We seek out those who reinforce our worldview – just look at your friends. We don’t go looking for those whose points of views challenge ourselves (unless we enjoy arguing or we’re sadistic). So why waste time trying to convince people with our marketing, who don’t share our worldview? Forget marketing to demographics. Just because someone falls into a demographic profile that mirrors most of your existing client base and “could” benefit, doesn’t mean they’re interested. Stop trying so hard. Focus your marketing on people who share your worldview. We’re busy. We’re distracted and overwhelmed. And we’re stupendously talented at blocking out information that isn’t relevant – we do this with our friends and family and especially with unfamiliar businesses. In fact, we’re verifiable ninjas wearing invisible blinkers. To get inside the narrow frame of blinker reference, our marketing needs to step up – we need to speak to our clients’ wants, needs, fears, aspirations – in their words, respectfully and intelligently, without patronising them. No doubt you’ve heard this before. Perhaps you’re nodding along, confident that yes, you know this already. But are you doing it? To be noticed in the first place, you’ll need to stand out, though not by shouting the loudest. You stand out by being personally relevant – speaking directly to people about their problems, issues, pains, anxieties or inconveniences. After catching their attention by directly naming their particular situations, it’s not yet time to talk about yourself. You’ve only just met and begun the wooing process. You still need to share your personality – not for authenticity’s sake but because people want to know whether or not they ‘vibe’ with your business. One of the most effective ways of doing this is through your marketing funnel. Before a person pays for your service or product, the highlight of your relationship is just after they’ve given you their email. Your email software program sends an automated welcome message. This is the beginning of your marketing funnel and, for many businesses, the end. The most common email marketing tool (which shall remain nameless) has a default setting that immediately emails the new subscriber the details they’ve only just submitted. Next comes monthly or semi-regular emails filled with general news about your business, hopefully including some valuable and interesting articles, but also promoting services or products which are limited by geography, no matter that your email subscribers hail from around the world. Don’t make people guess. We’re not mind-readers and we’re not going to work too hard to get a good impression of your business – that’s your privilege and responsibility. Introduce yourself, your business and keep repeating your most important messages. You’ll need to ask people to buy (and give them the opportunity to) multiple times before they actually will. Don’t like emailing your list too regularly because you don’t like people unsubscribing? Get notifications of these unsubscribes? Ran a Facebook ad campaign to drive people to an email opt-in, essentially paying for people’s email addresses, and then didn’t email them for six months? I’ve heard it all. It’s time to give up worrying about annoying people with your marketing. Things have changed. We don’t sit at our inbox and methodically open, read, trash, or forward emails. We don’t do a sober Google search, click into your homepage, followed by your About page, your services page, then read a few blogs, before striding towards your contact form. We don’t notice every little update you post on Facebook. With the best marketing funnels in the world, we climb down your chimney, trek soot through your carpet, leave the front door open, and wander out the back door. We make contact with your business only after we’ve had enough exposure to your marketing for it to be recognisable. How many exposures is that? Research suggests somewhere between 10 and 19 times. And you can bet it’s rising. Take your head out from under the pillow and recognise what you’re feeling now – exhausted, right? Or could it be overwhelmed? Or perhaps even a little angry? Things change. In the digital arena, change happens at the rates of knots. In the last nine years that I’ve been consulting, training and coaching in digital marketing, there are typically three stages to a new tactic, tool or technique. When it’s new, the bright-and-shiny people jump in. It then dies out without much of a petter, or it sticks around for the second wave. The early adaptors are now making hay, with plenty of ‘hacks’ that make these tools highly effective as well as well-priced (or free) because most people aren’t yet using it. Next, about 80 per cent of people dive in and marketers start trashing the joint with cheap-and-nasty techniques and messages designed to appeal to the lowest common denominator. The early adaptors start leaving. Party’s over. Thriving in business requires an attitude of open-mindedness to constant change and disruption. You have three options: you can embrace change, experiment, be curious, test and refine; you can launch a counter-attack to rally the like-minded, eloquently explaining why you don’t support something; or you can bury your head in the sand and become a grumpy bore. Marketing includes keeping up relationships with hundreds or thousands of people – your clients and prospects. If your business grows only at the rate of your word-of-mouth referrals, random passerbys and serendipitous web visitors, then it’ll plateau or slide slowly backwards. To truly use the power of marketing, we need to be attracting strangers and successfully converting them into new paying clients. And we don’t do that through broad, boring Facebook ads or same-same marketing emails. We need to get comfortable talking to strangers, sharing our opinion, and embrace our business’s nuances and difference. We need to let the human rise to the surface of conversation. For all the sophisticated marketing funnels, new social media channels and ‘hack’ techniques, far too often we overlook the most fundamental thing – developing rapport with strangers takes time. We need to stand out to attract people’s attention. This isn’t the difficult part. To keep their attention, we need to earn it. We need to conquer the art and craziness of staying on message while also giving up control. Marketing isn’t about convincing people to come around to your worldview, it’s about finding others who share a similar worldview. Make your marketing as personally relevant to your ideal client as possible to be effective. Give people a rousing introduction of your business, your style, your opinions, your approach, through your email marketing funnel. Everything changes (all the time). Burying your head in the sand is not a marketing strategy. Get comfortable talking to strangers. Business is a long game. Every little thing is gonna be alright (says Bob).